You've found the “U.S. 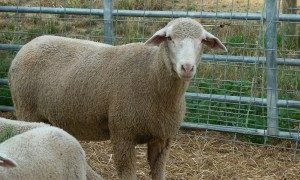 Rambouillet Sheep Breeders” page here at Hobby Farm Wisdom! If this is the first time you have visited our site: Welcome! Rambouillet is a breed of sheep that was bred exclusively by King Louis XVI in Rambouillet, France starting in 1801. The breed was developed from Spanish Merinos that Louis XVI purchased from his cousin, King Charles III of Spain. Rambouillet sheep differ from Spanish Merinos as they are much larger in body size with larger clips and wool length of greater than 3 inches. Mature Rambouillet rams weigh up to 300 pounds, with ewes weighing up to 200 pounds. The fleece is highly desirable in the manufacturing of cloth, including the mixed fabric of delaine. Besides its fleece, this breed also produces quality meat, both lamb and mutton. Today, approximately 50% of sheep on western ranches in the United States are part Rambouillet.